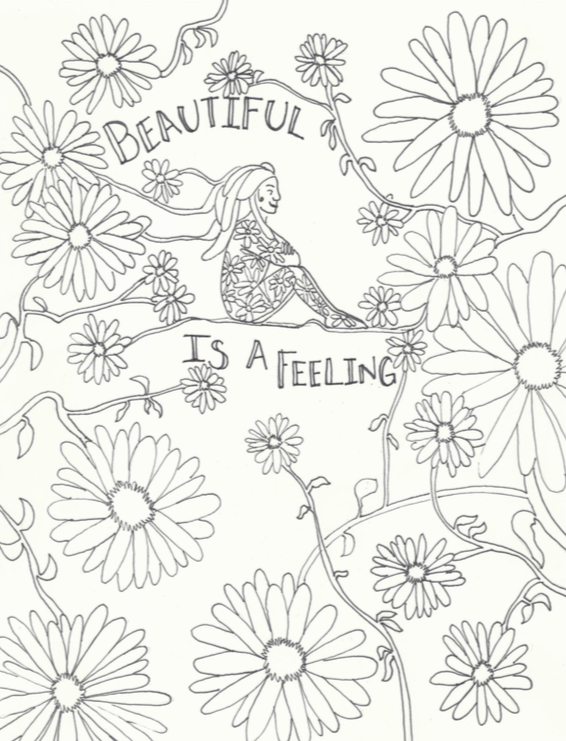 "This is a body positive coloring book I created a couple years ago. I have since donated over 500 copies to Embody Love, a non-profit movement that encourages girls and women to accept and love their bodies just as they are. This, you will find, is more than just a coloring book. This is a resource for you, anytime you need a little inspiration or direction toward a path of self-love. The creator of this book made it with you in mind. She understands the pressures placed on people to deny who they are, to conform to society’s norms, and to ignore the voices in your head and your heart. It is her hope that with this book, you will start shutting out the demands of society and tune in to what your body and mind are telling you. What do your body and mind sound like? They are loving, compassionate voices that will tell you to always give yourself the benefit of the doubt, to trust your gut, and to go easy on yourself. They will tell you to choose yourself first. They will tell you that you are not only worthy of love, but you, by way of being you, deserve it. This is meant to be a step down the path of self-love, a way in to a perspective that will define you in a more spectacular light."